#46 "Rifts - Dragons and Brodkil, Wormwood - The City of Worldgate, Heroes Unlimited - Modern Magic"
• Rifts® Dyval: More great source material that couldn’t fit in the book. 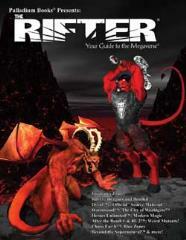 • Rifts®: Dragons in society. • Wormwood™ Addenda Three: The Free City of Worldgate. • Heroes Unlimited™: New magic character classes and a different look at magic in the HU2 setting. • Beyond the Supernatural™ monsters and more. • The latest chapter of Hammer of the Forge™, fiction.